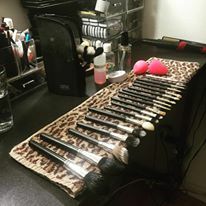 If I had a nickel for every client time a client had shown me her personal brushes, and was ashamed to admit how long it had been since they cleaned them, I would be a millionaire and never have to do makeup again! OK, if you follow my blogs you know I like to exaggerate a bit but it's true and so sad how little care goes into keeping these expensive beauties clean and functional! When a client asks me why brushes are so expensive and uses excuses like “I just use my hands” or “I prefer a sponge to apply my makeup” I shudder. There are so many reasons and factors that go into proper tool choice and also sanitation reasons for each. In this blog I will break down the types of tools that should be used for different makeup mediums as well as how to care for these tools. Natural Fibre - Brush hairs cut from animal hairs. Completely natural and porous. Synthetic Fibre - Brush hairs that are made from plastic or synthetic materials not found in the environment. Non porous. I can honestly say that in my 14 years of practicing makeup, I have had to replace 3 brushes in my entire career. You know why? Because I take care of them! This is why brushes are a certain price point. It’s an investment! You know that most people don't think twice when buying an iPhone or a new pair of sunglasses that cost $300+ and only last about a year, but then shudder at the fact that a good foundation brush is $32 and going to last you almost a decade. Most well made brushes should last you 10+ years if you are cleansing them properly with the right products and on a regular basis. I like to think of it this way, if you were making dinner for a party and you were serving Filet Mignon, would you then let your guests eat with plastic silverware? Absolutely not! Remember we don't need sterling silver flatware, but why put on a beautiful foundation with a cheap ineffective tool! This also applies to cleaning, you also wouldn't eat with a dirty fork that you haven't washed in weeks! Every person who wears and applies makeup should have a brush cleanser to use as a temporary cleaning or quick fix between washing brushes. I personally like the MAC Brush Cleanser as well as the Make Up Forever Instant Brush Cleanser, this product works exceptionally well when on a job being that it cleans so quickly and throughly! Shampoo can be boring and basic. While I have heard many experts say that baby shampoo is best, I personally have to disagree. There are too many conditioners and proteins in baby shampoo that can destroy the hairs on a natural fiber brush. We all know that packing a dead hair follicle with protein causes it to break, why would your brushes be any different? I use a boring shampoo. Not for color treatment, volume, etc. Just basic shampoo. TRESemmé makes a great one that is rather inexpensive and smells pretty good! I am also a big fan of the London Brush Company Brush Soap, and they come in some lovely scents as well. Lavender being my favorite. ***NOTE*** When shampooing, always keep the brush pointed downward with the brindle of hairs towards the sink. Never get the entire brush head wet and make sure not to saturate the brindle (part of brush where hairs are glued to the stem) with water. This can cause mold and bacteria to grow and cause brush hairs to fall out. Also remember to dry brushes horizontally or hanging downward. As pictured below, I prefer to lay a towel down and hang the brush heads off the edge of the table so they can fully air dry. Cream Based Products as well as Mousse or Dense Wet Products need a more consistent cleaning schedule being that they are wet and are more prone to bacteria. What products work with which tools? When picking a type of brush or tool to apply makeup there are many interpretations on why and what to pick. This is my go to rule of thumb. Powder Based Products usually require a Natural Fibre brush. The reasoning for this is that the bristles are able to pick up and hold product before applying it to your face. Synthetic bristles will pick up product from the container, but usually will fall off the brush before making it to your face. For eyeshadows, this is a tricky topic being that some brushes are dense and do actually give a great result. Mousse or Dense Wet Products as well as Cream Based Products usually require a synthetic bristle brush. 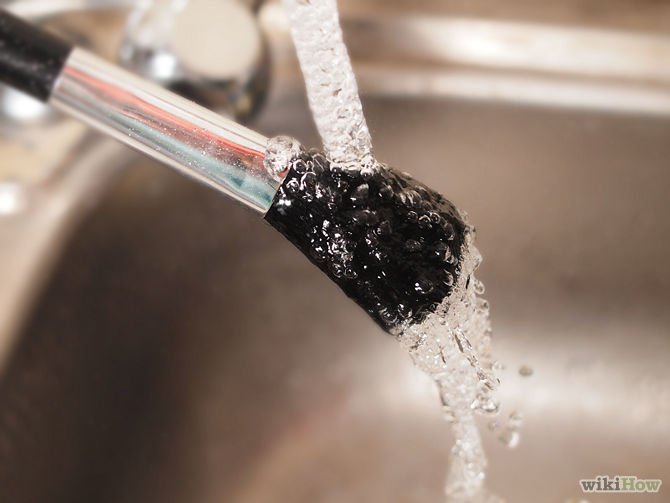 The reason for this is that its non porous, so the product will not have an opportunity to clog the bristle and build up. It is also great for application reasons being that it helps to smooth and buff the skin without shedding of bristles and absorption of product into the brush head. Many professionals use natural fibre brushes with cream based products, but for the average user, this is not recommended. When is a sponge ok? So for many years in my career I fought the use of a sponge. My stubborn amateur self was convinced that artists don't use sponges, until I met the fabulous Beauty Blender. I am sure you all have heard about it. I do not use this product to apply any base level of product, I do however completely wet and ring out the sponge and roll it on the skin after application of foundation in order to mimic the texture of skin on my clients. This a blending tool and NOT a replacement for a foundation brush ladies. Please remember that. Also, your Beauty Blenders should be replaced every 6 months and cleansed after EVERY USE with either the Liquid Beauty Blender Cleanser or the Solid Beauty Blender Cleanser. There are no exceptions on this. Any bad publicity they have gotten is purely because the user was not cleaning the product effectively in my personal opinion.